When I went to Costco recently and found a 10 pound bag of onions for $4, it was a deal I couldn’t pass up. But holy moly, that’s a lot of onions! I made Crockpot Caramelized Onions, Crockpot Spaghetti Sauce, and still had tons of onions to use or preserve. Could I freeze them? Hey, if Ore-Ida can do it–I can too, right? Plus it would be easier to chop and freeze them than to set up the dehydrator and leave it running for a day or two. 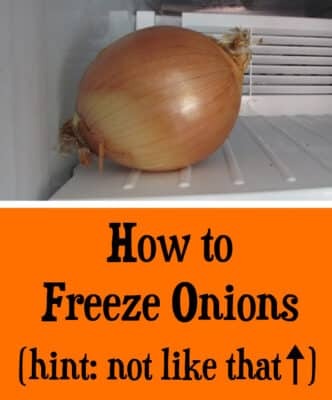 After a little bit of trial and error, I figured out the best way to freeze onions. They store well, and are easy to use in any cooked recipe. Here’s how easy it is! Peel and cut onions to whatever size you like. I prefer a large dice, since I can always chop them up smaller later. Tip: if your hands smell like onions after chopping, rinse with water and then rub a drop of lemon essential oil on your hands. It’s good for your nails too! Cover the pan tightly with aluminum foil and freeze for several hours to overnight. This is why you don’t want to pile the onions too deep in your pan. See the bowl on the right? That’s an onion popsicle. I banged it, thumped it, ran water on the bowl, and tried to chisel the onions out with a knife, all to no avail. 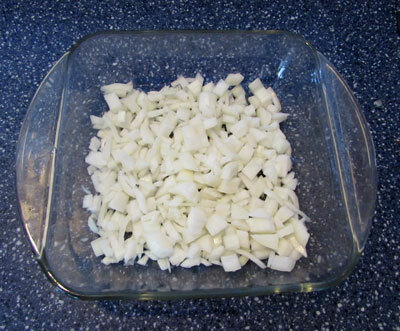 But when the onions are in a nice shallow layer, you can easily free them from the pan and break up any chunks with a fork. 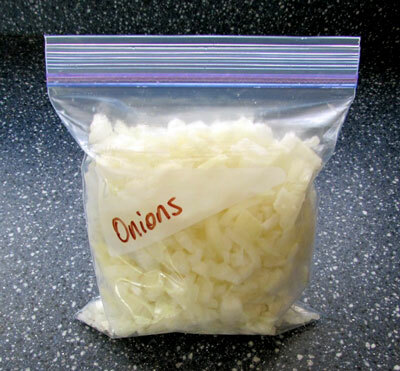 Store your onions in a zip-top bag and stash them in the freezer. Because they’re already frozen when you store them, they won’t stick together and you can measure out whatever you need for your recipe. 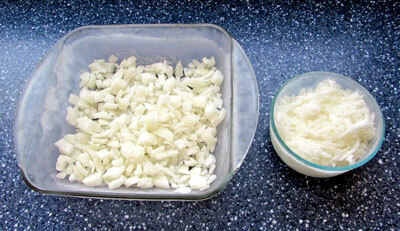 Frozen onions are perfect for use in soups, stews, sauteeing with vegetables–just about any cooked application. You don’t even have to thaw them! 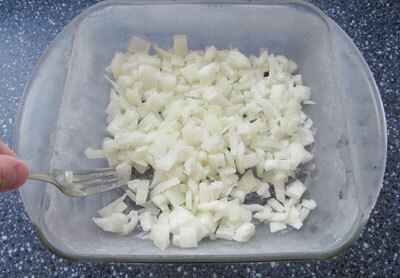 Freezing changes their texture, so I don’t recommend using frozen onions in fresh dishes like salsa or potato salad. What’s your favorite onion dish? This is a great idea! I also got sold on having cubes of pureed roasted onion in the freezer back when we were doing homemade baby food, because they can be so convenient for adding roasted onion flavor to normal food, too. I just throw mine in a plastic zip top bag to freeze. If they clump, I bang them on the counter a couple of times and they’re fine. Cuts out the freeze then repackage step. I use them fon homemade pizza, in spaghetti sauce (especially store bought to spice it up a bit), almost anything but salads. I also do this with bell peppers and use them for many of the same things. I grate zucchini and summer squash and freeze it. It’s definitely a lump, so I freeze it in single serve quantities. 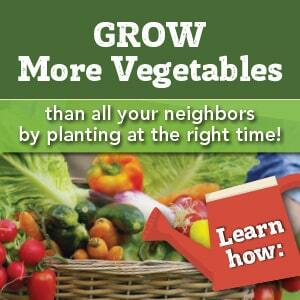 I add it to soup and spaghetti sauce to sneak in extra veggies that no one notices. No lemon? Rub your hands with something stainless steel. Williams and Sonoma sells a SS “bar of soap” to use. But you can save the 10$$ by finding something already in your kitchen. It is not a good idea to chop and freeze the onion because the chopped onion absobs the microbs and also the vitimine c will go away!!!! Do frozen onions get stronger in taste? Washing your hands with salt will remove the smell of onions or garlic. You are SO smart! I freeze mine in ice cube trays first, then put the cubes into a larger freezer bag but your way is less labor intensive which I’m ALL about.